Product owner Paul Kelman tells us about a new apprenticeship feedback service designed to help employers share views on training providers. We’re developing an exciting new feature so that users can give feedback on aspects of their apprenticeship programmes. Initially we’ll ask employers to give feedback on their training providers. Employers want to know what other employers think of training providers - they regularly tell us this in our user research sessions. We have listened to employers who tell us that they want up-to-date information and to hear from their peers when it comes to apprenticeship training providers. Feedback will initially be available to employers that use the apprenticeship service. We aim to bring all employers onto the apprenticeship service, so eventually everyone will be able to give feedback on the training providers that they use. My team’s challenge has been to capture and share useful feedback from employers. We had to understand what information our users needed, and figure out how to capture that information. We don’t interpret scores or create algorithms, averages, or “good” or “bad” labels. We simply feedback exactly what our users have selected. We are currently designing ways to notify training providers when they receive feedback so that they can address any issues raised. In future, we plan to make employer feedback a key metric in all searches made on the Find apprenticeship training service. 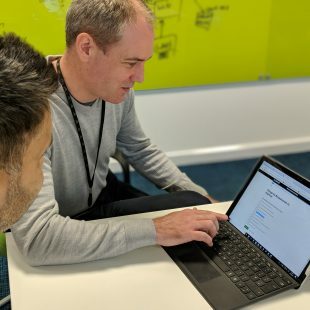 The aim is to give employers the information they need to help them filter search results so that they can choose training providers that best suit their needs. 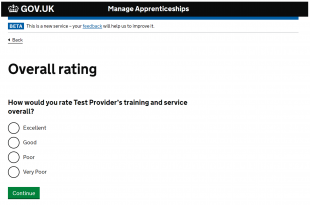 We’re also looking to allow users to filter feedback results based on the kind of feedback they want to see - for example, some employers are keen to only see reviews from employers in their sector. Once the initial feedback model is up and running, we’re looking to rollout a similar model more widely. We want employers to give feedback on specific apprenticeship standards and end-point assessment organisations. The first release is due very soon. We’ll start with a small number of users and steadily build it up. We’ll learn, iterate, and improve. Employer feedback is not moderated before it is published on Find Apprenticeship Training. The Provide Feedback tool asks employers to rate their training provider based on a prescribed list of attributes. Employers are asked to select particular strengths and areas to improve from a list of items such as “adapting to employer needs”, “improving apprentice skills” and “providing the right training at the right time”. They are then asked to rate the quality of their provider’s training, on a scale from “excellent” to “very poor”. Employers are not asked to provide written responses. Employers can only give feedback on training providers that they have registered apprenticeship starts with in the Apprenticeship Service. This means that we know the feedback will come from a genuine user of the training provider. The service is in Beta phase (live testing), so we'll be continuing to talk to employers and providers to see whether any issues like this arise. If they do, we will work through how best to address them. Find apprenticeship training sounds really useful - where can I find it (no links in the blog)? I have also added links into the blog. Can you confirm where employers can actually leave feedback on training providers? The apprenticeship service will periodically invite by email all registered users of the employer account to feedback on the training providers used to deliver their apprenticeships. Feedback is shown in the provider’s details on Find apprenticeship training and will be anonymous.